I have travelled to many countries and have been treated to some mind-boggling visuals, combination of white sands/bluish waters of Eagle beach in Aruba, waters of different colors from turquoise to cobalt blue waters in Turks and Caicos lying next to each other, spectacular views of Maine, nature at its best at Costa Rica but nothing captivated me more than a trip to Hogenakkal. Even after 9 years, it was my complete Mind/body/spiritual travel experience. Hogenakkal, a quaint little village on the border of Karnataka/Tamilnadu sitting on the Cauvery river with its spectacular waterfalls, which makes it a nature lover’s paradise. 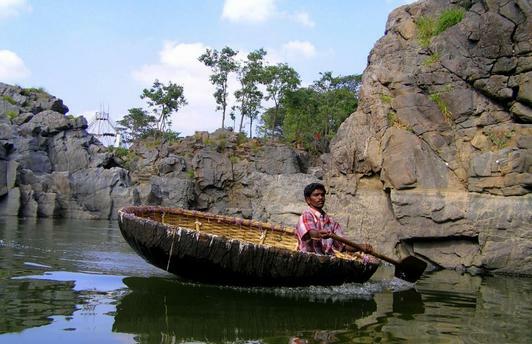 But what makes it complete is a boat trip through the waterfalls, a crude though inviting oil massage with the shower worthy of a poor prince helped by the boatmen and the food served with freshly cooked rice, fish curry and fish fry. Maybe it is the soul stirring experience here which has captivated me and would make me violate two main travel rules of mine, “Do not travel to same place again. There are thousands of new places to see in the world” and “A travel is not a fulfillment for me if the land I visit is not far away”. I had then visited India during the winter months of December/January in 2006, to coincide with the pleasant season of Tamilnadu and escape the brutal winters of USA, when I was traveling from Villupuram near Pondicherry to Bangalore with my family when we decided to swing by Hogenakkal having heard lots when I was young from my father and many of my friends especially about the massage and the food but never paid much attention then. Driving into the village the view was not something pleasant. I could see few Jawans of Special Task Force (STF) sitting there with their sub-machine guns a year after the end of the scourge of the bandit Veerappan in these areas. It gave a sense of caution as I was with my family members and my protective instinct kicked. But it provided me the comfort that the Jawans were there. We were immediately surrounded by a few boatmen who were inviting us to make avail of their services for our trip through the water falls. The small boats or Coracles called as “Parisal” in Tamil can accommodate about 4 people including the boatman and we haggled for prices for two of them as I had 5 family members with me including my wife. Before we proceeded to the water falls, we saw women selling fresh fishes caught off the waters just then and we bought about 5 pounds of fresh fish and paid for the cooking to an elderly woman so that the food would be ready when we come back from our trip. The boatmen carried the Coracles through a few hundred feet journey before the enchanting view unfolded in front of me and I gasped regretting not having visited this place before. It immediately drew a comparison to Hawaii as I had just visited it couple of months back and Kerala backwaters which I had visited just a few days back and felt that the scenery of Hogenakkal is up there with Hawaii and Kerala backwaters. 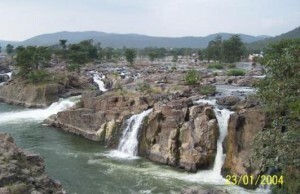 The river was full as the Cauvery waters were just released from Krishnaraja Sagar dam from Karnataka. I was told that the water was a few hundred feet deep. It did cross my mind what would happen if the small Coracle developed problems but the overwhelming visual experience took over my mind. I realized it later that this thrill is what spiced up the whole trip. The boatmen rode the Coracle and took us near the various waterfalls, an exhilarating experience which made the Maid of the Mist cruise in Niagara Falls dim in comparison. 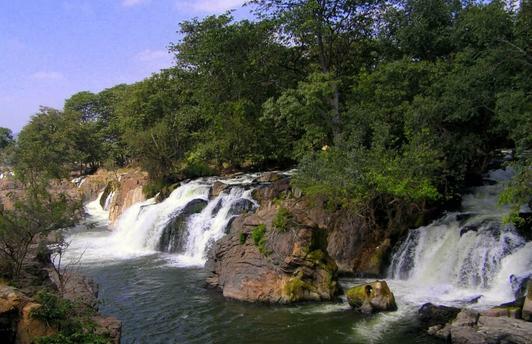 The Boatmen offered to provide the men a massage and a shower in one of the isolated places among the 27 odd waterfalls. And when we agreed this time without the haggle as we had heard great things about this massage beforehand, one of the boatmen vanished and after a few minutes reappeared with Sesame oil packet in his hand. All 3 of us (2 brothers and I) had a nice massage. I felt like I was a dough in their hands though it was very relaxing and the boatmen washed us with shampoo. Once the massage was over, I felt the hunger pangs as we returned. The food was ready prepared by the elderly lady. The freshness of the fish and the cooking just then combined with the cooking skills of the elderly lady made it one of unforgettable food experiences I ever had. The food with rice, fish curry, fish fry was sumptuous that the ladies in my family got the recipe from the elderly lady and the men packed the leftover fish fry/fish curry. We carried with us to Bangalore which my other family members enjoyed thoroughly though the food was cold by then. It did not occur to me then that what I am experiencing is something special due to my mind still immersed in the experience. But when I think or hear about that place even years after that, I could see my mind fill up with very pleasant thoughts. Still when I think about the place I get mixed feelings – most underrated while lesser places are promoted within India as must see travel destinations but at the sametime feel good it is underrated that it is untouched yet by commercial tourism. 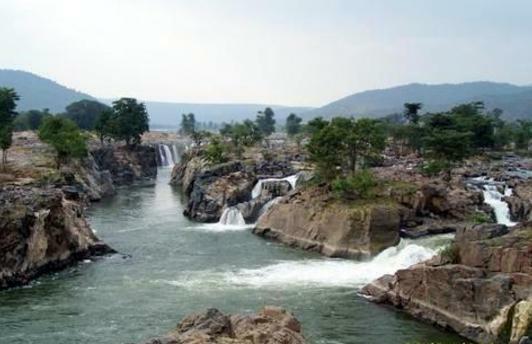 It is worth a day trip from either Bangalore or Chennai as it is almost half way between these two cities. Public transportations were available 9 years back though I assume it would only have become better. 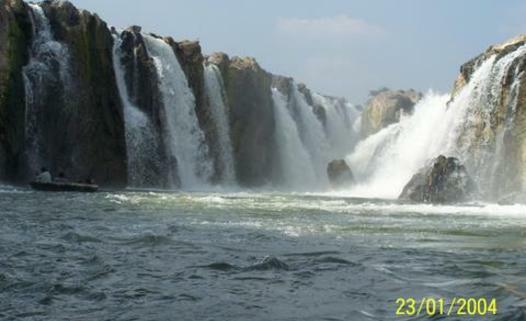 During my stay in Bangalore I had been to another such waterfall Shivasamudram and enjoyed such a boat ride. As you went there with the kid, you would have that experience, hence i want to ask you your feedback.